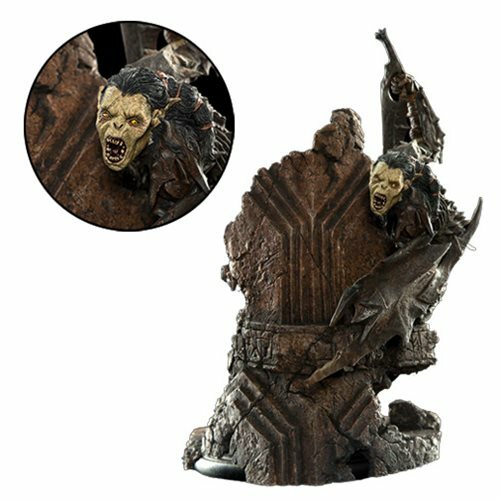 Add to your collection of Middle-earth sculptures with this Lord of the Rings Moria Orc Statuette! This impressive statue features one of the orcs of Moria scaling a broken pillar. Whether it is a prop replica, beautiful environment, or a iconic character, each WETA collectible was giving the same level of care and attention to detail that was given to the film work. This Lord of the Rings Moria Orc Statuette measures about 7-inches tall x 4 1/3-inches long x 4 3/4-inches deep. Agile and roach-like in their scaly armor, the rodent-like Orcs of Moria infested the once proud Dwarf city, looting tombs, fouling its ancient galleries, and claiming its treasuries. In the dark, they brooded over their victory, jealously guarding the empty halls against intruders. For long years, they lay undisturbed until, by chance or fate, Frodo Baggins and the Fellowship of the Ring sought to pick their way unseen through Moria, rousing the Orcs to battle. Ages 15 and up.